What they managed to escape in September is now a reality. While we were in Christchurch this summer we saw a great deal of damage and entire streets blocked off. Yet for the most part, the major landmarks were still open, under repair, or basically sound. We visited the Cathedral though we were unable to go inside. Many of the old buildings had minor damage, particular to the cornices. It was clear that there were quite a few buildings in the downtown area closed due to structural weaknesses that made them all unsound. The city still felt busy and vibrant and very much a tourist attraction with streams of visitors pouring through the parks, museums and churches. And now it are all just flattened. Everything came down. The aerial photos look like someone detonated a large bomb in downtown Christchurch. The spire on the Cathedral is simply gone. Earthquakes are something I grew up with. They don't frighten me nearly so much as hurricanes, tidal waves, or tornados. But on the other side, I also know how bad they can be, how they make everything feel broken. The ground is broken, buildings are broken, your sense of self is broken. After a big one, it feels like the whole world is unstable. 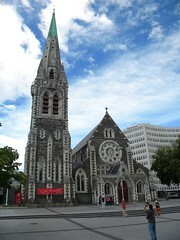 New Zealand is such a small place, and Christchurch is one of its largest cities. It's the city where Jaime wants to go to college. It's a beautiful, vibrant community. And it is absolutely, unrepairably broken. Oh sure, they'll rebuild. But there are just a lot of folks not coming back from this one. Even when you rebuild a highway, house or building after an earthquake, it doesn't feel the same. What's broken beyond repair is the certainty that a building is a solid object on which you can count resting on ground. That sense of the very word 'ground' as something that is unchangeable and static never returns. If you want to help, both the Red Cross NZ and Salvation Army are taking donations. There really is something faux about rebuilding. Many of those landmarks are so precious, because of their architecture and history. You can't replace that. They are hundreds of years old. Wonder if they'll just have to completely clear out and rebuild vs restore. I spent less than a year in NZ, but it has become my baby. Take care of her for me. Thinking of Christchurch. Having lived through seeing friends and family lose their homes, their way of life and communities from Ike and Katrina, I know how devastating the loss can be. It takes years to emotionally recover, no matter how quickly things are rebuilt.